Create a team of two fighters and use weapons and your fists to win in single-round sudden death tag-team matches! Experience the feel of an advanced battle system that pairs mid-battle character change-ups and easy commands leading to rush combos! “KIZUNA ENCOUNTER” is a fighting game released by SNK in 1996. Create a team of two fighters and use weapons and your fists to win in single-round sudden death tag-team matches! Experience the feel of an advanced battle system that pairs mid-battle character change-ups and easy commands leading to rush combos! Hamster's next Neo Geo release for the Switch is Kizuna Encounter, which is set for release on Jan. 10th, 2019. Here's a blurb on what the game is all about. 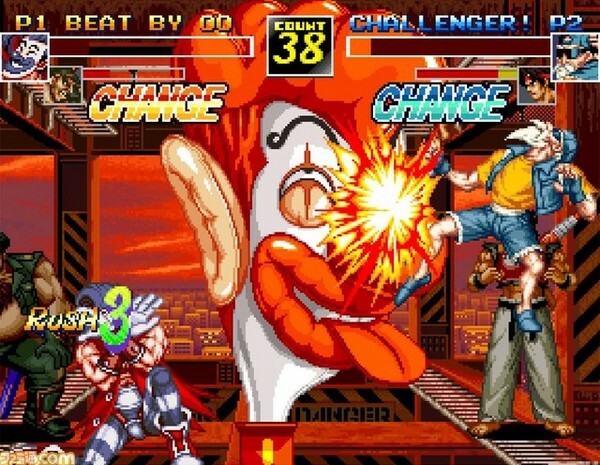 Kizuna Encounter is a 1996 competitive fighting game produced by SNK for the Neo Geo arcade and home platform. It is the sequel to Savage Reign. The Kizuna Encounter fighting system is similar to the Real Bout Fatal Fury fighting system. Notable additions include the tag system, in which players have the ability to switch characters in-game by pressing the tag button while standing in their team's tag area.